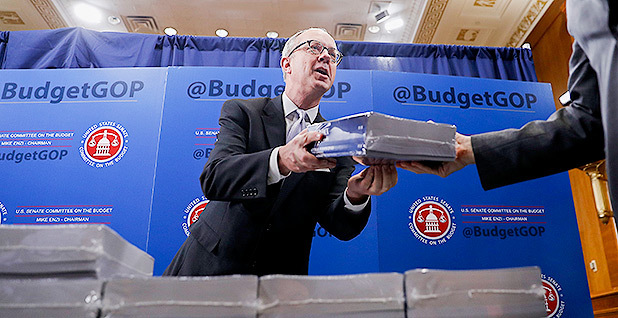 Senate Budget Committee Republican staff director Eric Ueland distributes copies of President Trump’s fiscal 2018 budget request to congressional staffers. The budget request calls for an unprecedented 30 percent cut to U.S. EPA. Photo by Pablo Martinez Monsivais, courtesy of AP Images. This story was updated at 2 p.m. EDT. President Trump has proposed a dramatic downsizing of U.S. EPA. The White House released its "fat" budget proposal for fiscal 2018 today, expanding on its plans for massive spending cuts at the agency. Overall, Trump wants to slash EPA by about 30 percent, taking spending down from more than $8 billion in fiscal 2017 to $5.7 billion for fiscal 2018. The president would cut about a fifth of EPA's workforce. The budget envisions roughly 11,600 employees working at the agency, down from more than 15,000 today. The proposed worker drawdown seems to surpass the administration's "skinny" budget released in March. Back then, the White House said the agency would have 3,200 fewer jobs in fiscal 2018. Today's budget proposes about 3,800 fewer positions. The spending blueprint follows the administration's mantra of returning the agency to its core mission and retreating from functions that states could manage in EPA's place. "The President's budget respects the American taxpayer," said EPA Administrator Scott Pruitt in a statement. "This budget supports EPA's highest priorities with federal funding for priority work in infrastructure, air and water quality, and ensuring the safety of chemicals in the marketplace." Congressional Democrats were quick to slam the plan for EPA. Sen. Tom Carper (D-Del. ), ranking member on the Senate Environment and Public Works Committee, said the proposal revealed "empty promises" from Trump and his team. "He's told us he would work to promote clean air and clean water. He's claimed that protecting Americans is important to him and said repeatedly that he wants to rebuild our country's infrastructure. But his budget proposal makes it abundantly clear that those were nothing more than empty promises," Carper said in the statement. The budget would reduce or eliminate several major EPA programs. Many lawmakers from both sides of the aisle, however, have indicated the president's plan is pretty much dead on arrival. The budget targets EPA's categorical grants, which are doled out to state environmental regulators to help enforce laws like the Clean Air Act, Clean Water Act and Safe Drinking Water Act. The president has proposed a nearly 45 percent cut to those grants, requesting $597 million for fiscal 2018. The White House said it wanted to eliminate or reduce federal spending on state actions that go beyond EPA's requirements under law. To make up the difference, states can prioritize programs or find other funding sources, including fees, the budget plan said. Trump's budget would eliminate funding for popular EPA programs like Energy Star, which certifies products as energy efficient, as well as other voluntary efforts related to energy and climate change. Documents said the administration "is committed to returning EPA to its core work," arguing there is no need for the agency to run programs that can be taken on by industry associations and consumer groups. The budget would zero out EPA's geographic programs, despite fierce pushback from lawmakers. Efforts to help clean up the Great Lakes, Chesapeake Bay and Puget Sound would be no more. President Trump has indicated he sees spending on climate change programs as money down the drain, and the budget reflects Office of Management and Budget Director Mick Mulvaney's assertion that it's "a waste of your money" (E&E News PM, March 16). The blueprint would provide about $1.8 billion for agency environmental programs and management in fiscal 2018, a decrease of more than $800 million compared with the $2.6 billion lawmakers approved for this year. That includes a total of $310 million for Clean Air Act and climate change regulatory activities. Within EPA's budget narrative, the words "climate change" are not explicitly mentioned. The document refers to a "market-based approach" to reducing emissions of air pollutants permitted under the Clean Air Act. "The EPA will work with states and sources to implement the Greenhouse Gas Reporting Rule to obtain high quality data in a cost-effective manner," the document said. Mulvaney today referred to a "climate change musical" by the National Science Foundation when asked about climate science funding at a White House briefing. "What I think you saw happen during the previous administration is the pendulum went too far to one side, where we were spending too much of your money on climate change and not very efficiently," Mulvaney said. "We don't get rid of it here," he added, "Do we target it? Sure. Do a lot of the EPA reductions aim at reducing the focus on climate science? Yes. Does it mean that we are anti-science? Absolutely not." The budget would discontinue funding of the Clean Power Plan, climate change research and partnership programs. Federal support for air quality management, a category that includes EPA's air toxics program and support for development of state implementation plans, would be chopped 24 percent, from $132 million to $100.4 million. The clean air allowance trading program would be cut by more than 22 percent, from $23.9 million to $18.5 million. Opponents are already bracing for a fight. "The clean air program, including budget and legislative and regulatory provisions, are under attack," Bill Becker, executive director of the National Association of Clean Air Agencies, said in an interview yesterday. "We're at the time where it's important to stop the bleeding." The budget includes $76 million for the federal vehicle and fuels standards certification program. The National Vehicle and Fuel Emissions Laboratory would see a 25 percent cut, from around $108 million in 2017 to $80 million. An internal EPA budget memo leaked earlier in the year had proposed cutting the lab's operations by $48 million, or 90 percent, and halving its staff. A 25 percent cut could still seriously hamper the lab, which has been expanding its testing program following the discoveries that Volkswagen and Fiat Chrysler diesel vehicles polluted more than allowed. The budget envisions the lab focusing "on certification decisions." It would continue to "perform its compliance oversight functions on priority matters". It would also "conduct, at a reduced level, testing activities for pre-certification confirmatory testing for emissions and fuel economy for passenger cars." Funding for cleaning up the country's most polluted sites would be cut by more than $300 million under the budget, the White House said, despite Pruitt calling it one of his top priorities (Greenwire, May 11). "In FY 2018, the agency will prioritize its efforts on the most significant sites in terms of environmental impact and potential cost liability to the government," EPA said. The agency said it plans to "maximize" this amount by reducing administrative costs, identifying efficiencies and prioritizing the cleanup of sites with existing funding. EPA also plans to merge the federal facilities enforcement program with the Superfund program to "optimize resources" between the two. The Superfund enforcement budget would be cut by more than $56 million, the administration said. In all, the budget would fund Superfund cleanups at $515.8 million. The enforcement amount would be $94 million. Just yesterday Pruitt announced the creation of a Superfund Task Force to provide recommendations on how to "streamline and improve" the program (see related story). Funding for the brownfields program would also drop by several million dollars to $16 million. The budget would impose an almost 24 percent cut on programs under the umbrella of the Office of Enforcement and Compliance Assurance, reducing them to $419 million in fiscal 2018. By way of justification, the administration describes environmental enforcement as "a shared effort" between states and the federal government. The budget would allow EPA "to maintain a core enforcement oversight role to ensure a consistent and effective program, but eliminates duplication of enforcement actions carried out by the states, and focuses federal enforcement efforts in those states that do not have delegated authority," the document says. Funding for criminal enforcement would fall almost 17 percent to $44.5 million. Spending on overall civil enforcement activities would be sliced about 20 percent to $143.3 million. Funding for the environmental justice program, set at $6.7 million this year, would be eliminated. Mustafa Ali, the program's associate assistant administrator, had quit in March out of concern over the White House's plans. Reporters Hannah Hess, Sean Reilly, Cecelia Smith-Schoenwalder and Camille von Kaenel contributed.